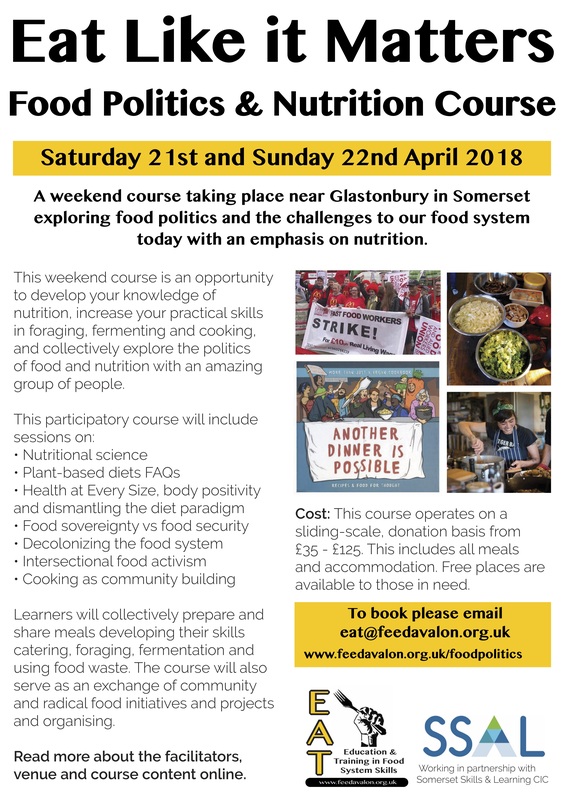 A weekend course taking place near Glastonbury in Somerset exploring food politics and the challenges to our food system today with an emphasis on nutrition. This weekend course is an opportunity to develop your knowledge of nutrition, increase your practical skills in foraging, fermenting and cooking, and collectively explore the politics of food and nutrition with an amazing group of people. Learners will collectively prepare and share meals developing their skills catering, foraging, fermentation and using food waste. The course will also serve as an exchange of community and radical food initiatives and projects. Cost: This course operates on a sliding-scale, donation basis from £35 – £125. This includes all meals and accommodation. Free places are available to those in need.